Last Friday I had the pleasure of running an event for a very large National Sporting Committee. 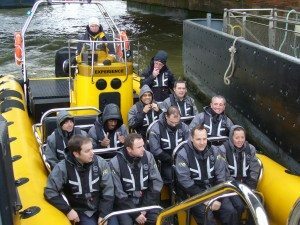 As part of their annual away day they decided to participate in our Land and Sea Event. Arriving at Waterloo station at 10 am I met the group of 30 who would be participating in our Cab Clue Trail in the morning followed by lunch and then our Thames Power Blast in the afternoon. Once I had briefed the 6 teams they headed off in their cabs to their secret destinations around London, I then made my way to the restaurant where I would be waiting for them, one team made it back very quickly with about 15 minutes to spare, this probably had something to do with the extra 100 points they would receive for being the first team back. One by one they arrived to Chez Gerard where their 3 course meal was waiting for them. While the group enjoyed their lunch I sat and marked their papers. The Thames. The route would take them past all major London landmarks from the Dome to the MI5 building including high speed runs past Parliament , the London Eye, under the Millennium Bridge, under Tower Bridge etc. Once into the open river by Canary Wharf we run full throttle and demonstrate why ribs are so much fun. The day went very well and the feedback was very positive from our client. If you are interested in booking our Cab Clue Trail or Thames Power Blast for a corporate event please contact us.